The food culture of the Philippines is sometimes overshadowed by it’s northwestern neighbors – Thailand and Vietnam. But the Philippines can easily hold its own on the global culinary stage and even came in second in a 2015 CNN poll asking readers what country was their favorite food destination. From the ubiquitous adobo to the cringe-worthy balut, Filipino cuisine is varied and delicious (though not always particularly healthy). In fact, Anthony Bourdain claimed the best pork he ever ate was in the Philippines. We spent 2 months travelling around the islands and trying all of the amazing Filipino food we could find. 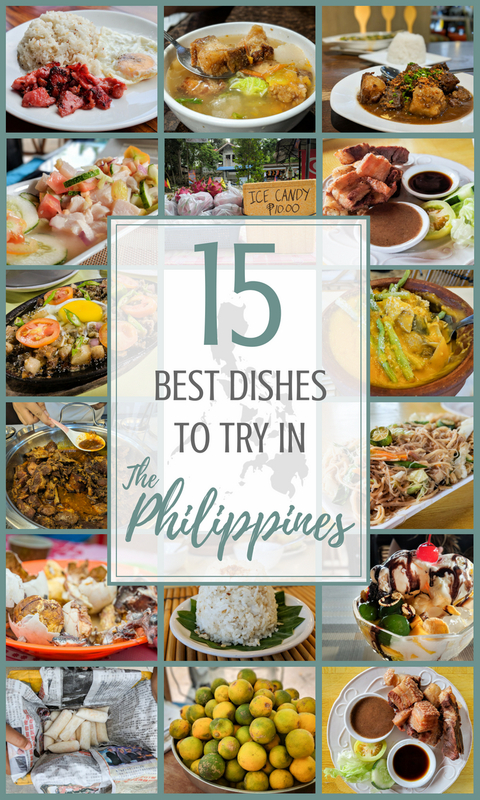 We have compiled 15 of the best dishes in the Philippines for your sampling pleasure – make sure you try them all! Tocino is the Filipino version of bacon. It is pork belly cured in sugar, salt, and various other spices then fried – yum! It is served as part of a common Filipino breakfast called tosilog. The name is a combination of its 3 parts: tocino, sinangag (garlic fried rice), and pritong itlog (fried egg). There are lots of different versions of the silog breakfast trio that simply replace the Tocino with another meat options. Tapsilog features marinated beef (‘tapa’), bansilog has fried fish (‘bangus’), and maybe the least adventurous choice is hotsilog which simply includes a hot dog. 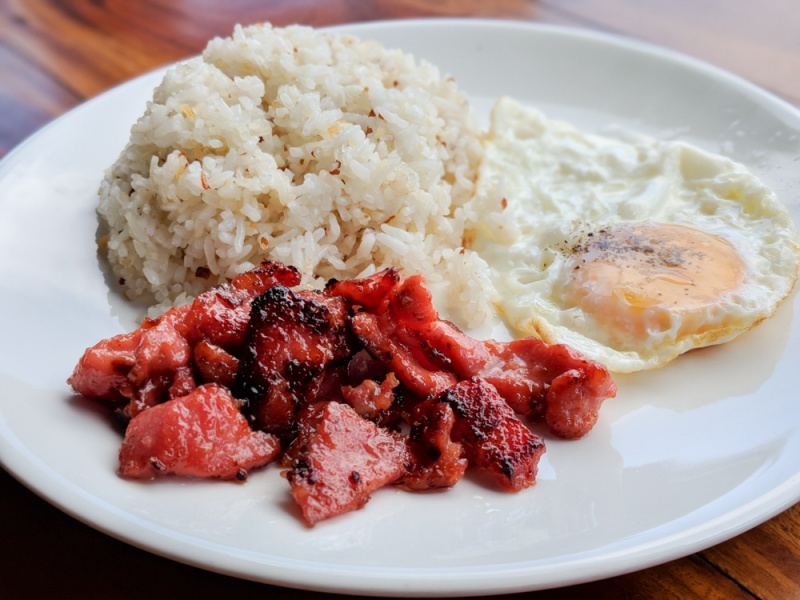 Our favorite by a landslide was tosilog because who doesn’t love bacon? Kinilaw is a delicious seafood dish served up all over the Philippines. It consists of slices of raw fish marinated in vinegar along with other ingredients like calamansi juice, salt, pepper, and chili peppers. The name kinilaw literally means “eaten raw”. 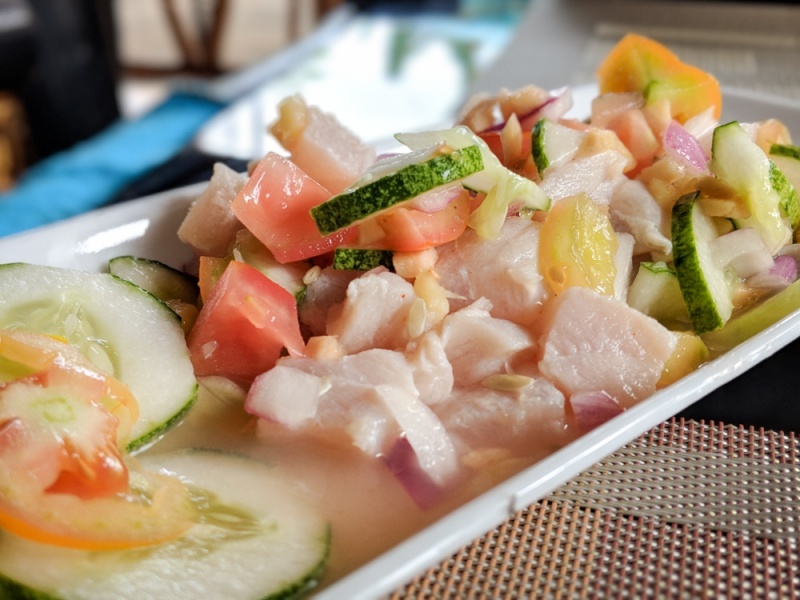 Very similar to ceviche, the main difference is that Kinilaw relies on vinegar rather than lime juice to “cook” the fish. Filipino food can be pretty heavy so if you’re feeling like you need a healthy alternative, kinilaw makes a great appetizer or light lunch. Sinigang is a sour soup that is typically made with pork and tamarind though sometimes other sour fruits like guava, green mango, or calamansi are used instead. Tomatoes, garlic, onion, and various other vegetables complete the stew. 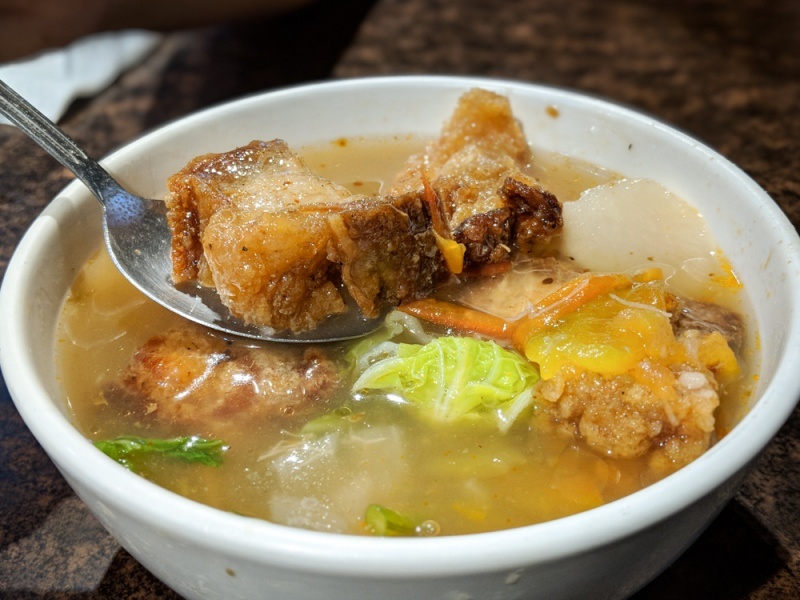 It’s a delicious Filipino comfort food and makes for a hearty hangover breakfast if you had a few to many Pilsens the night before. 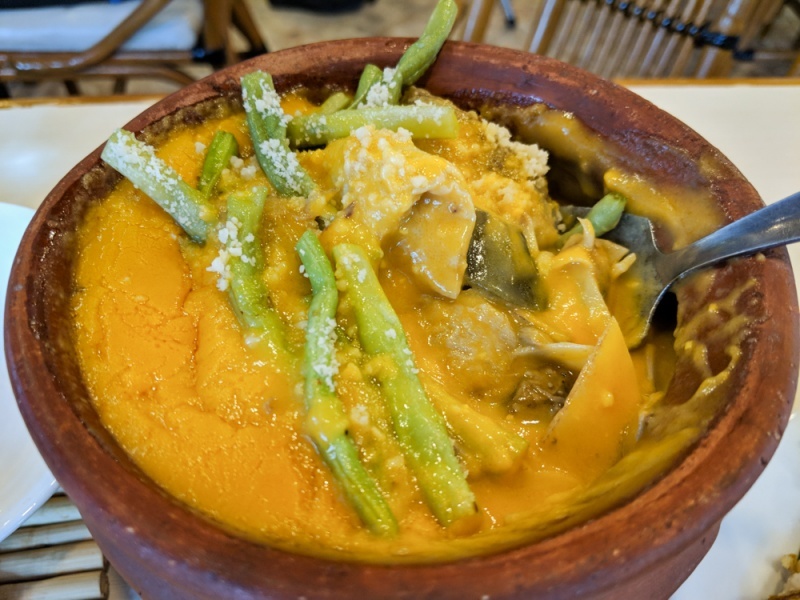 Kare-kare is a thick stew made from oxtail, vegetables, and a peanut sauce. It reminded us a bit of massaman curry from Thailand which makes sense as the word ‘kare’ is derived from the Filipino word for curry. Supposedly the best kare-kare comes from Pampanga which is just north of Manila, but you’ll find this dish served all over the country. You’ll know someone has ordered sisig when you hear the sizzling and see the steam rising off of the cast-iron skillet. It’s like Filipino fajitas! 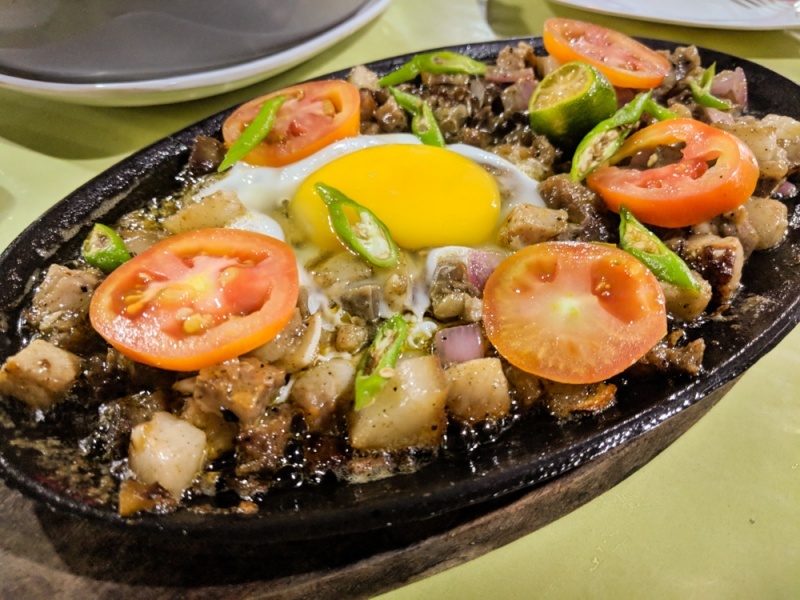 Pork sisig is most common and it consists of chopped up pig ears, jowls and liver, onion, and chili peppers delivered on a sizzling hot skillet with a raw egg on top. You’ll need to mix in the egg to cook it before the skillet cools down. It usually comes with a couple calamansi halves so you can squeeze the juice over the top. Other versions of sisig include pork belly, chicken, tuna, eggplant, and pretty much anything else you can put on a sizzling hot plate. Adobo is often called the national dish of the Philippines and it’s certainly the most famous Filipino dish. The flavor is created using vinegar, soy sauce, garlic, bay leaves, and black pepper. Also chili peppers are sometimes added to give it a little spice. The most typical adobo dishes are chicken and pork but you’ll find every restaurant in the Philippines has their own take. The meat can either be cooked into a stew or marinated in the adobo sauce and then pan fried. If there is one dish you should try before you leave the Philippines it’s pork adobo! Humba is very similar to adobo, but also includes banana blossoms and tausi (fermented black bean paste). This gives humba a sweeter taste than adobo and results in an amazing spicy/salty/sweet flavor. 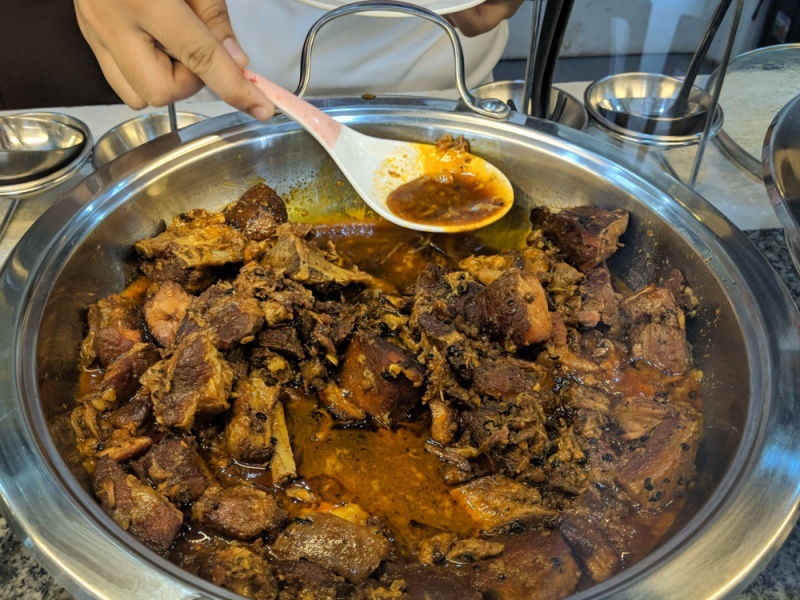 Whereas you can find the adobo flavor applied to all types of meat and vegetable dishes, humba is almost always made with pork. 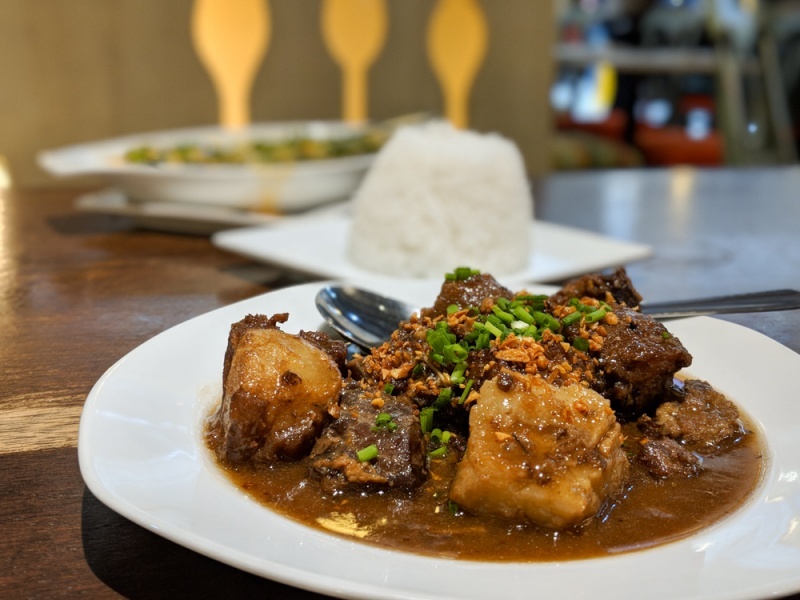 You’ll encounter humba in the southern islands of the Philippines and it’s even sometimes referred to as Cebu’s version of adobo. Make sure you try them both and see which you prefer! Just as there are many ways to prepare pork (and many different cuts of meat) there are plenty of ways to prepare and serve lechon after it has finished roasting. It can be eaten right off of the carcass with a side of sinangag (garlic fried rice) or the leftovers can be added to dishes like sinigang or paksiw na lechon. 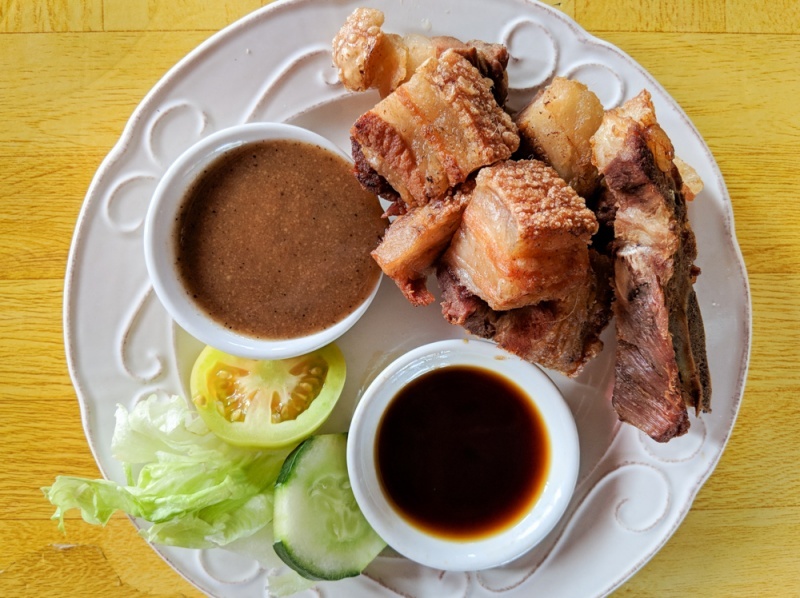 Our favorite was lechon kawali which is crispy fried pork belly served with two dipping sauces: toyomansî (a spicy sweet combination of soy sauce, calamansi juice, and diced chili peppers) and mang tomas (made from ground up pork liver). 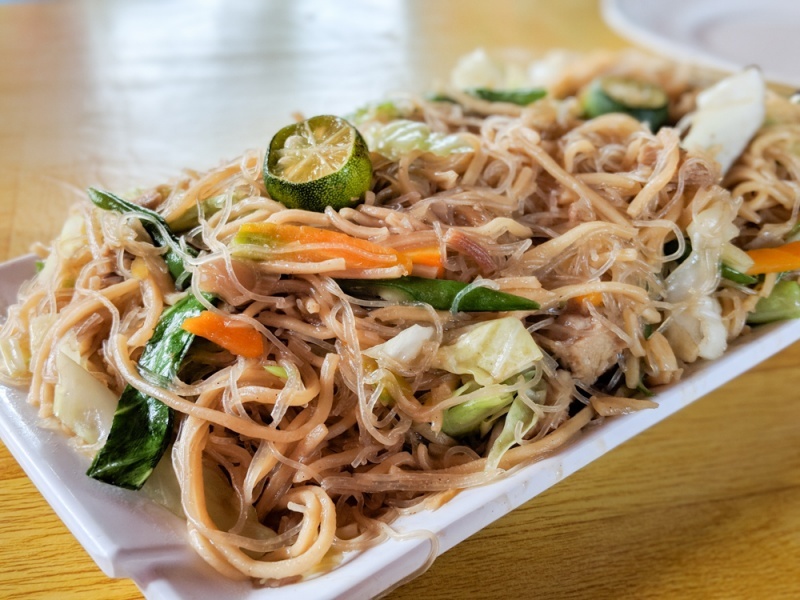 Pancit guisado is basically just fried noodles and you’ll see them offered at almost every restaurant you visit. They typically come in three varieties: pancit canton, pancit bihon, and bam-i. Pancit guisado is a delicious side dish to add to your meal but be aware that the portions are often huge so it’s best to plan on eating family style with several other people when ordering. Sinangag is pretty simple and straightforward – it’s just garlic fried rice. It’s made by frying white rice in a wok or pan with lots of garlic. Other ingredients like egg or vegetables can be added in a similar way to Chinese-style fried rice. But in the Philippines it is typically prepared with just garlic so it doesn’t overpower the flavor of the meat it is being served with. 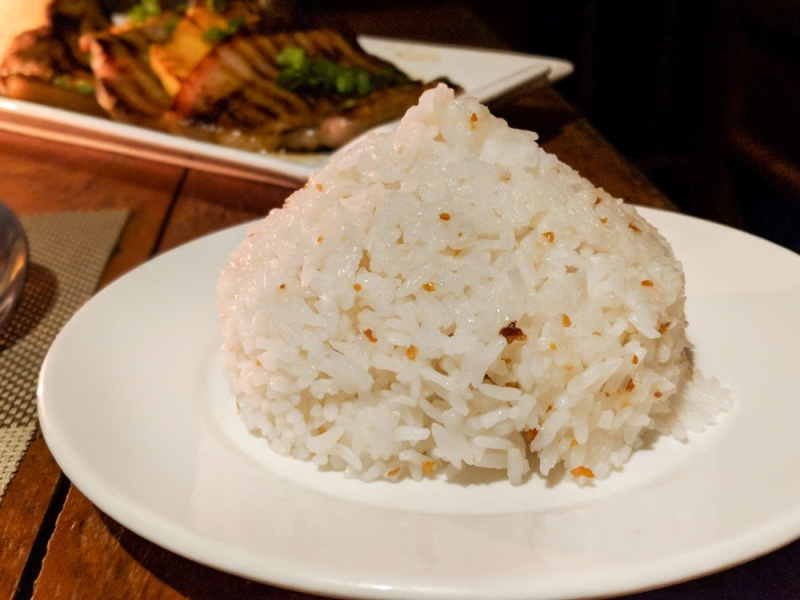 Basically every Filipino restaurant will offer garlic rice as an alternative to plain old white rice, but you may have to pay a little more for it with your meal. In our experience it was always worth it! Balut is probably the most infamous street food in the Philippines and the most likely to be a part of a drunken dare involving tourists. It is basically just a boiled duck egg. However, the duck eggs used for Balut have been fertilized and allowed to incubate anywhere from 14 to 18 days. Ihe ideal incubation period for the perfect balut is 17 days. The result of this fertilization and incubation is an embryo that is well on its way to becoming a duck. This means you’ll be gobbling down partially formed bones, feathers, and even a tiny crunchy duck beak and squishy eyeballs, yum! 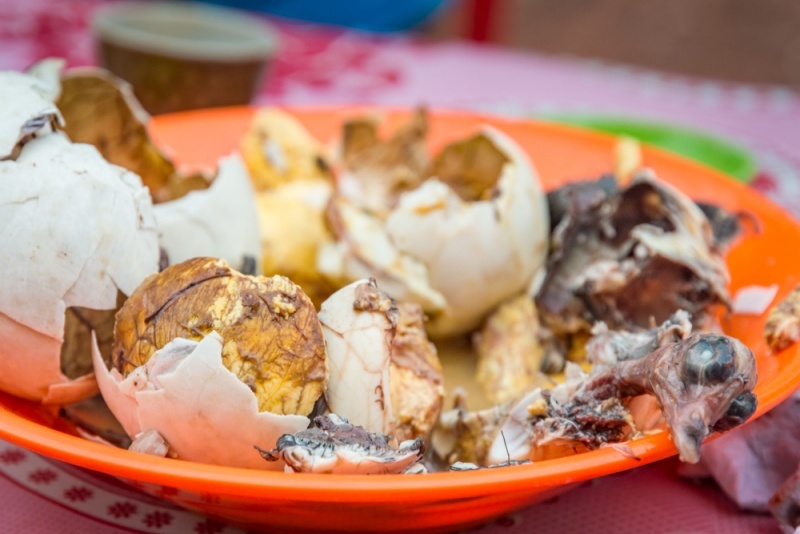 To eat balut, first break a hole in the top of the boiled egg and add the mix of vinegar, salt, and chili that you’ll be given to the liquid surrounding the embryo. Slurp this broth from the hole in the top. Then you’ll consume the embryo either with a spoon or just crack the entire egg open and eat it in the same way you would eat a boiled egg. If you’re a bit shy about trying this dish then go for the 14-day version as the embryo won’t be as developed and you won’t have to chew your way through as many bones and feathers. 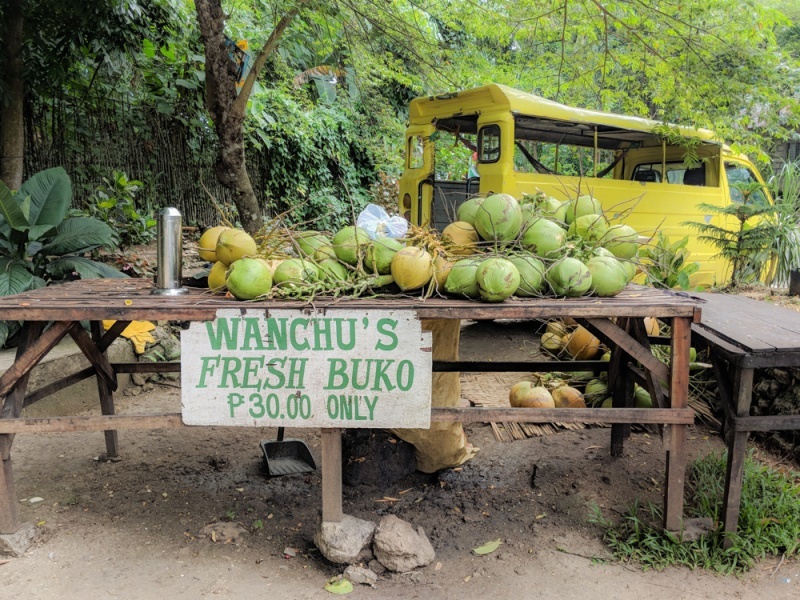 Spend a single day in the Philippines and you see the word ‘buko’ everywhere – on roadside stands, restaurant menus, and on half the drink labels at the convenience store. It can be a bit confusing at first until you realize that buko is just the Filipino word for “fresh young green coconuts”. The Philippines grows over 15 million tons of coconuts a year, the second most in the world right behind Indonesia, so it’s no wonder that you’ll find them for sale everywhere. Be sure to order an ice cold buko while lounging on the white sand beaches of the Philippines! Calamansi are small green and yellow fruits that taste like a mix of an orange and a lime. 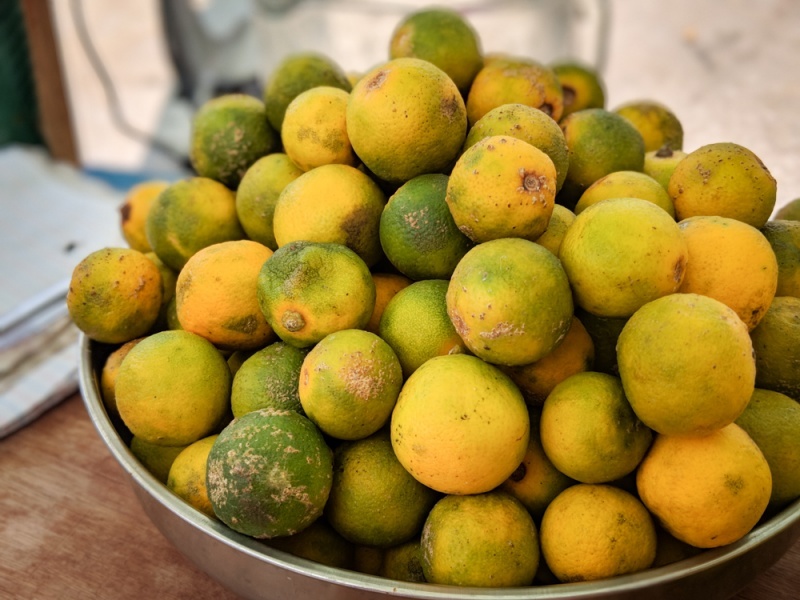 If you have actually read this post up to this point you’re probably starting to see just how important calamansi juice is in Filipino cuisine. It’s used in just about every dish as a marinade or sauce. While many of the dishes you’ll be eating in the Philippines will already be flavored by calamansi, you can also order a glass of the juice at most restaurants. The juice by itself is quite sour so you’ll usually be asked if you would like to have sugar added. Some restaurants also add honey or ginger as both are excellent compliments for the citrus flavor of calamansi juice. Ice candy is an incredibly popular dessert in the Philippines. Many enterprising locals hover around popular tourist attractions carrying coolers filled with these delicious, refreshing treats. 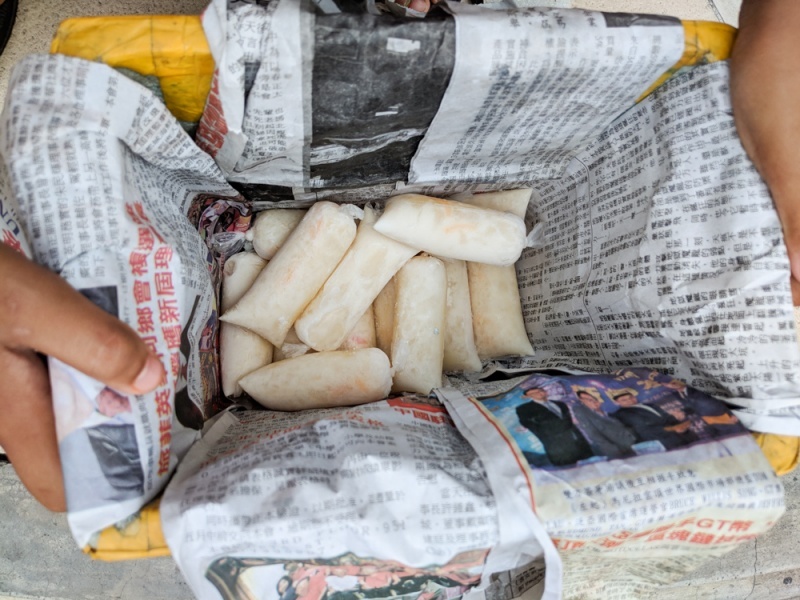 Ice candy is made by mixing fruit juice with sugar and milk, then pouring it into slender plastic bags that are tied shut and frozen. Ice candy is eaten just like a homemade push-pop. Tear or bite off the top of the plastic and squeeze from the bottom. 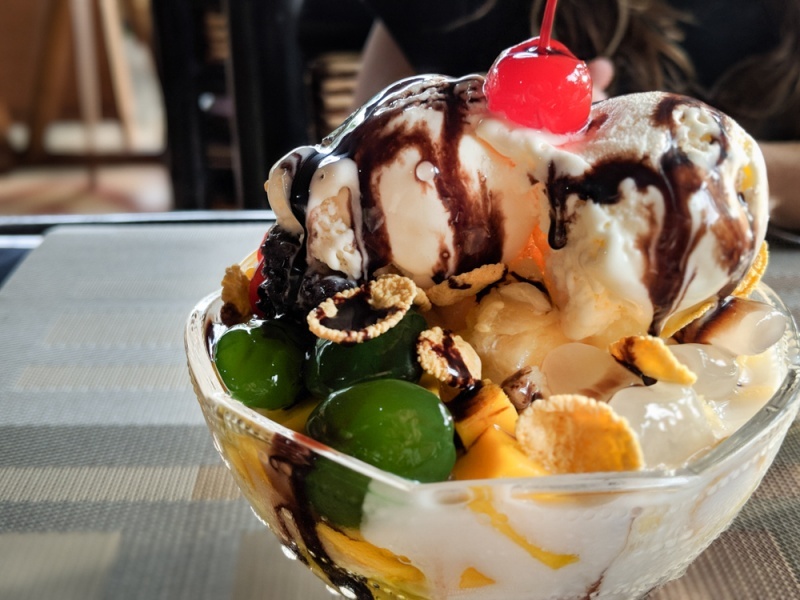 You’ll encounter all kinds of flavors of ice candy such as mango, chocolate, ube (purple yam), buko salad (which includes lots of little bits of chopped up fruit mixed), buko pandan (pandan tastes a bit like vanilla), melon, and avocado. Ice candy is also amazingly cheap. No matter where we were in the Philippines it always cost just 10 pisos (~ $0.20). We recommend that you buy one every chance you get! Literally meaning “mix mix” the name halo-halo is a pretty apt description for this traditional Filipino dessert that includes every sweet treat the restaurant has in their refrigerator and freezer. The main ingredients of halo-halo are shaved ice, ice cream, and condensed milk. It could also include fruits such as lychee or mango, sweetened red beans, jellies, corn flakes, and coconut strings, just to name a few. It’s served in a clear glass so you can see all of the layered ingredients, and it’s up to you to mix it all up into a sugary delicious mess. Enjoy! Did we miss anything? Add your favorite Filipino dish in the comments below. Planning a trip to the Philippines? 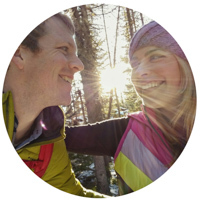 Check out our favorite travel guides and books!